The Income Tax Department has sent tax notices to thousands of people whose actual income has not matched with the income declared on their income tax return (ITR) form. There has been a spike in the number of income tax notices as over the years the Department has developed an extensive risk analysis system to identify persons who are non-compliant. The statement 26AS is issued under Section 203AA of the Income-tax Act, 1961. It shows details of taxes deducted from your income by an employer, a bank, including a tenant. It. While filing the income tax return form it is always advisable to download your 26AS statement from the website of the department of income tax, as any mismatch can result in a tax notice. The reason for improved monitoring is the fact that now more data is available with the income tax department ranging from Form 26AS, ITR and bank details. The Department has sent notices after examining and verifying details as part of its return processing exercise. Not just for the last assessment year, many people have received income tax notice for previous assessment years as well under section 148 of the Income Tax Act. How to deal with a tax notice? 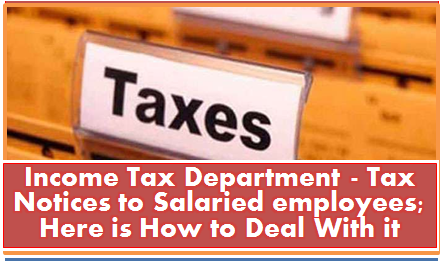 Income Tax Department has sent tax notices on mismatch of income Most of the tax notices are issued under Section 143 (1A) and Section 148, The statement 26AS is issued under Section 203AA of the Income-tax Act, 1961. It shows details of taxes deducted from your income by an employer, a bank, including a tenant.